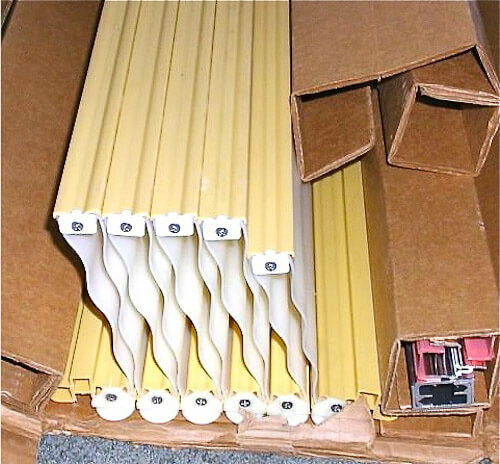 Dustin of the 170 New Old Stock (NOS) plastic wall panels in mind-bending colors mentioned that he also has 10 NOS accordian door shower doors available for sale. Of course, I asked for pictures, pretty please. 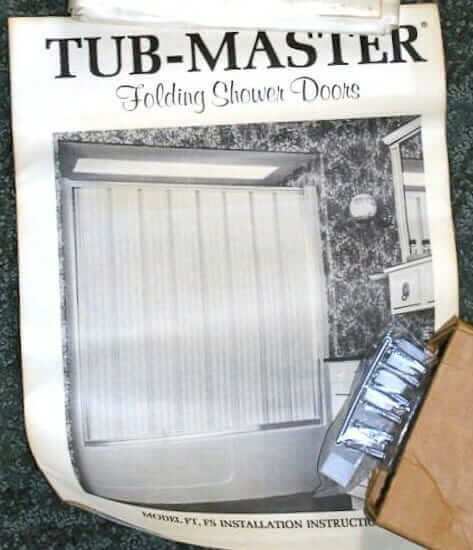 UPDATE: We also found a story that sells accordian shower doors made new here. Here is one assembled. I like the yellow rails. Still in their original boxes…–> Readers interested in buying any of these doors: Please contact Dustin at sitdropspeak@gmail.com. For reference, I first saw and featured one of these in 2008. 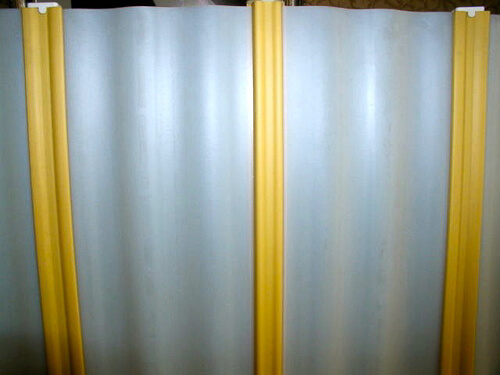 Above is the accordian shower door in Carrie’s bathroom. See her adorable Cinderella ranch house here. 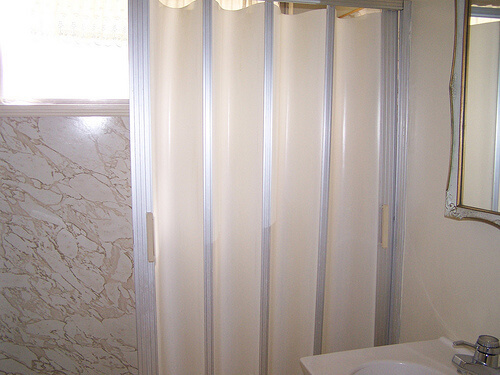 We also saw one of these accordian shower doors in a time capsule house that Mary Deluxe toured. 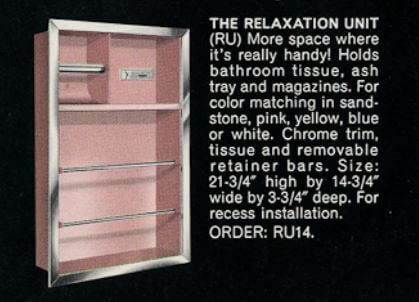 Dustin says that he remembers installing a door like this in his parent’s Winnebago. Indeed, this style of door would seem great for a vintage travel trailer because it is so lightweight. 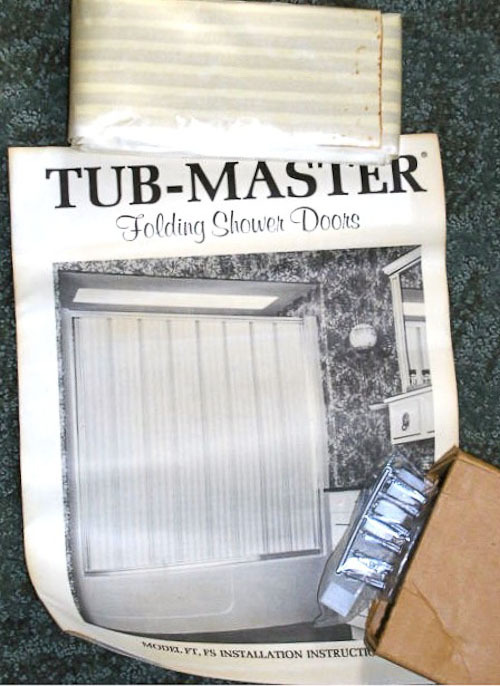 Check out my story on 10 styles of vintage shower doors we’ve seen in reader houses. 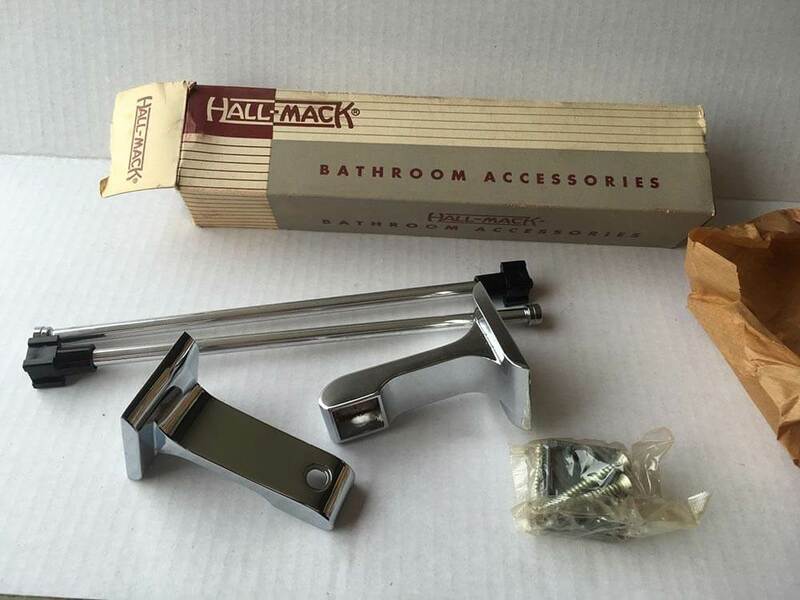 A classic ’60s bathtub door. 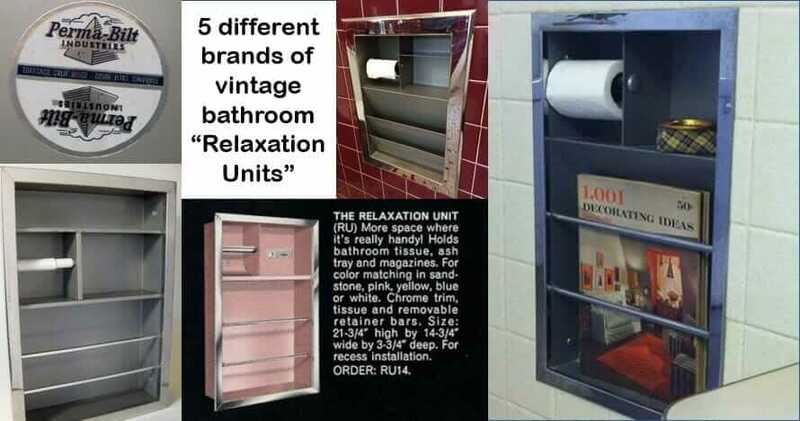 We had them in our ’64 GE Gold Medallion home. Loved them. 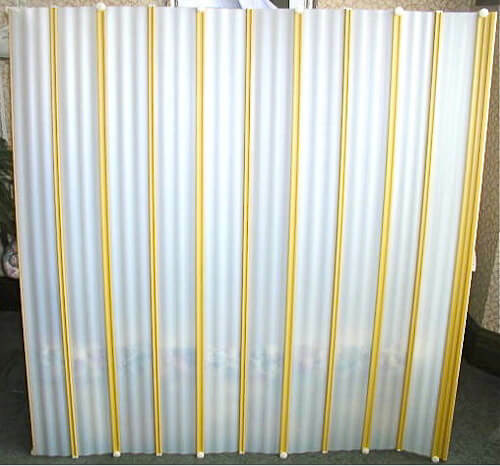 I have a shower cubicle with a Tub Master 4 section folding door measuring 730 wide x 1700 high, I have changed the panels and fitted light blue tinted ones to the 3 sides, do you have anything that would match or know where i could get one. Ray, we do not sell anything here. 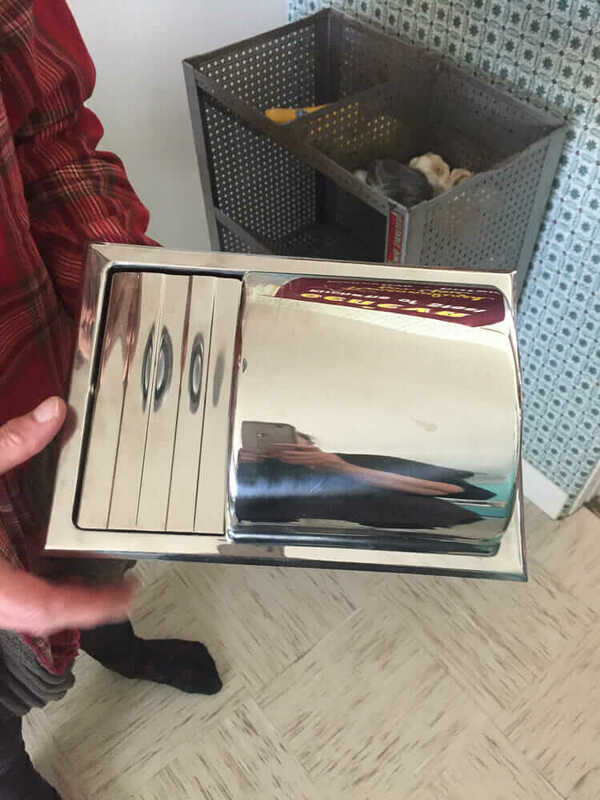 We write about companies and folks who have hard-to-find items. You need to contact the companies profiled in the stories. Look for the links in bold blue. We have our tub master down, cleaned and ready to install. It is all back together except the top rail and how the heck do we get it back in and installed????? Hi Josie, this is not a DIY site so I have no idea!